2016 has definitely been an unusual year. A number of upgraders and refineries were taken out of service for maintenance in April only to lose feedstock in May during the Alberta wildfires. 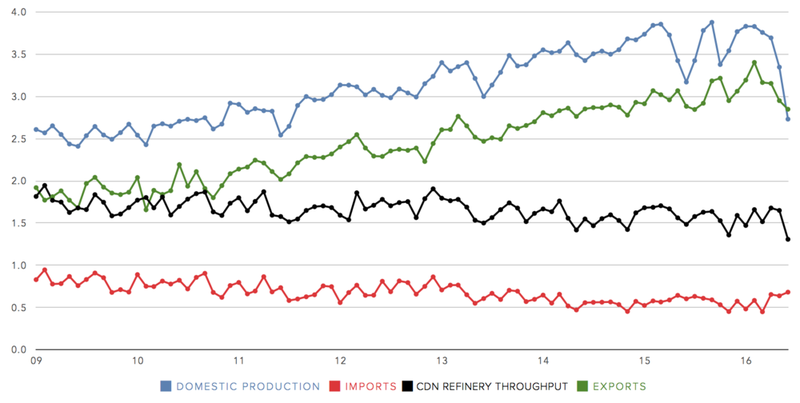 But ignoring the past few months of data points, some key trends have definitely become apparent in Canada's crude oil trade data. Sometime in 2010, production began to ramp up quite aggressively. Although conventional and offshore oil production has been flat to negative in recent years, production from the oil sands has gained considerable ground, rising from about 1.4 million bbl/day in 2010 to a high of 2.4 million bbl/day earlier this year. Most of that production boost has come from in-situ facilities, where bitumen is extracted in place using steam. These smaller plants are cheaper and faster to bring online. Improvements in technology have also made them considerably more efficient at recovering bitumen than in the old days. The net result is a 50% increase in Canada's total crude oil output in just the past 5 years, with another 250,000 bbl/day being brought online by the end of next year. This one is a bit counterintuitive. 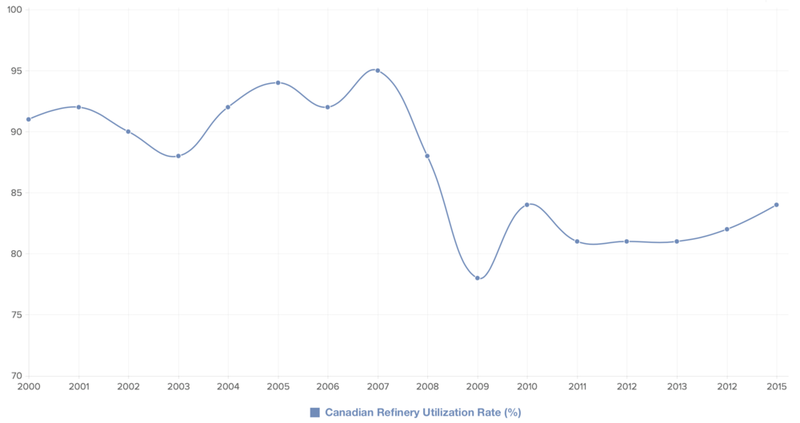 Refining capacity has held relatively steady over recent years, even rising slightly since the late 1990s. But refineries are actually producing less final product. The total volume of refined products has been steadily declining since 2005. That's because utilization rates have been declining over the past 10 years, from a high of 94% in 2007 to the low 80s in recent years. The lowest numbers tend to be on the East Coast, where the cost of crude oil feedstock is higher. Discounted crude from Alberta is too expensive to ship to eastern refineries (due to lack of pipelines) and seaborne crude sells at premium Brent prices. That makes it cheaper to just import refined products from the US and Europe, which often have a surplus. As domestic production rises, crude oil imports have been slowly falling over the past decade (the past few months excepted), from almost 1 million bbl/day in 2009 to a low of 500,000 bbl/day in the past few years. But those number excludes the imports of refined products, particularly gasoline and jet fuel imported into Ontario and both the East and West coasts. That adds roughly another 200,000 bbl/day to the import picture. And those imports carry with them a larger price tag. Despite adding over 1 million bbl/day of domestic production, very little of those added volumes are being consumed domestically. Since Canadian oil consumption is relatively flat (at about 2.3 million bbl/day) and imports are only slightly lower, Canadian oil exports have risen dramatically. Exports have grown from about 2 million bbl/day in 2010 to a high of 3.4 million bbl/day earlier this year. That's a gain of 70% in only 5 years and explains why the Canadian dollar has been dubbed a "petrocurrency", rising and falling with oil prices. As oil exports have risen dramatically over the past decade and the value of that oil has gained ground, the total value of Canada's exports ballooned, which explains why the Canadian dollar now rises and falls with the price of oil. Although there are a wide variety of products imported and exported into and out of Canada, energy products represent by far the largest net sale for the country, estimated at $3.3 billion last June. Although autos and consumer goods represent a larger portion of Canada's international trade, the country imports far more of those products than it exports, which doesn't help the Canadian dollar. So how can Canada decouple its currency from oil prices? It would actually be very difficult without a substantial drop in oil prices or shutting in oil production. Reducing the imports of value-add energy products to near zero (especially refined products and natural gas) would help, but only to a small degree. And as oil production rises in the next few years, the problem is unlikely to go away anytime soon. As the Bank of Canada has pointed out many times, the best case scenario would be a big increase in non-energy exports. If the country could produce more cars, more airplanes and more consumer goods, the impact of oil prices on the currency would be diminished.